The essential characteristics of OWL are, first, to integrate proven technologies into a novel system concept and, second, to rely extensively on serial, industrialized fabrication of identical building blocks. As a result, technology development is limited to few, well defined areas, and risks, costs and leadtime can be kept within manageable limits. What is active optics ? What is adaptive optics ? What is the benefit of larger telescopes ? What are the largest telescopes today ? Where will OWL be located ? When will it become operational ? OWL's objective is to provide both resolution and sensitivity in a reliable and cost-effective manner. Individual science objectives generally imply specific requirements, from which system ones are derived. Because of the diversity of applications and the limitations of technology, conflicting requirements must be addressed by suitable trade-offs. As all scientific objectives benefit from an increased aperture size, and because the telescope size and cost are closely related, constraints which would imply overcosts must be wighted against a decrease of telescope diameter. This also applies to telescope engineering. Performance cannot be measured in technical terms only; it must encompass cost, leadtime, and risks. OWL incorporates key fabrication technologies and system solutions that are the trademarks of the current generation of large, 8- to 10-m telescopes: active optics (NTT, VLT, Subaru, Gemini); optical segmentation (Keck, Hobby-Eberly, GTC, SALT), low-cost optics and structures (Hobby-Eberly, SALT). The only feature which truly extrapolates from state-of-the-art technology is adaptive optics. The overall performance of a telescope depends not only on the quality of its design and construction. Technical and scientific operations must be taken into account right from the initial design phases, with a view to maximizing uptime and providing transparent operation. The user is ultimately interested in science, not technology. OWL's dimensions allow to rely extensively on modular design, integration and maintenance, with large numbers of identical parts, components and modules. As a result, construction and operation costs are very low for a system of this size and capability, and mutliple supply and integration lines allow a fast construction schedule. Virtually all telescope parts can be shipped to the site in standard 40ft containers. All major dimensions are integer multiple of the segments size, thereby simplifying interfaces and allowing a distributed transfer of loads from the optics through substructures, to the main structure and eventually to the foundations. A byproduct of segmentation is that once the enclosure, the telescope structure, kinematics, and control systems are functional, the telescope can become operational even though its primary mirror is not yet entirely filled. Existing segmented telescopes have indeed been turned to the sky before full completion, albeit for engineering runs only. Those have, however, no more than 36 segments in total -compared to 3048 for OWL. Optical fabrication is therefore no longer on the critical path and engineering work will be essentially completed at an early stage. The telescope will progressively enter into science operation when its aperture will have reached 60m. At that point, OWL will be equipped with its first stage, first generation adaptive optics for the compensation of atmospheric turbulence, and thus be able to deliver unmatched scientific results already. According to conservative estimates, this could occur around 2017, with the telescope being completed by 2021. A faster schedule would be possible, subject to early funding. Why not a classical design ? How is the optics made ? How are the segments kept aligned ? The baseline design is comparable to that of the Hobbby-Eberly telescope, the main difference being a secondary, segmented flat folding mirror allowing a shorter structure. 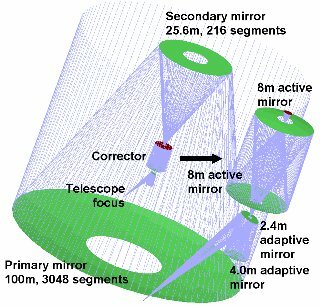 The 100-m primary mirror will be made of 3048 heaxagonal, all-identical segments, each 1.6-m in size. The 25.6-m secondary mirror will be made of 216 flat segments, also 1.6-m large. The segments will be made of low expansion glass-ceramics or silicon carbide. 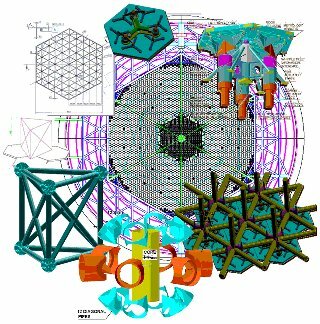 Spherical and field aberrations are compensated by means of a 4-elements corrector, conveniently located mid-way in the telescope structure. The corrector includes two flexible eight-meter class active mirrors (similar to the VLT primary mirror), a 4.2-m focusing and a 2.35 flat, fast steering adaptive mirror for first stage adaptive correction. 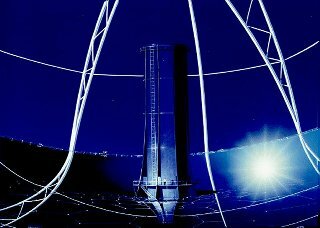 The 4.2-m mirror will eventually be replaced by an adaptive one, thereby permitting the compensation of atmospheric turbulence over larger fields. A crucial property of the design is that, contrarily to classical designs, tight tolerances for alignment do not apply to the (flat) secondary mirror, where the structural flexures will need to be in the centimeter range -a figure deemed excellent for a steel structure of OWL size. Instead, tight tolerances apply to the alignment of surfaces inside the corrector, a subsystem of large but still much more manageable size and mass. Design optimization is already quite advanced, with much higher stiffness and lower mass than initially thought. Why a lightweight design ? 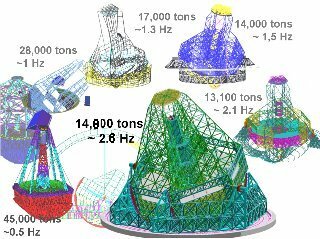 The telescope will have an alt-azimuthal steel structure, with a moving mass of 14,800 tons. However impressive this figure may seem, it should be noted that a conventional telescope design extrapolated to OWL size would lead to about a million tons. Detailed stress and fatigue analysis have shown that the OWL design already meets the applicable safety requirements. Composite materials will be used for tensioning cables and perhaps at specific locations of the structure - provided that doing so improves performance and safety at reasonable costs. The moving mass could be reduced to about 8,500 tons if the segments were made of silicon carbide. The telescope will be mounted on friction drives (bogies) "rolling" on steel tracks. A large (~300) number of bogies will be used to distribute loads; each bogie will be fitted with a standard motor. The drives will be hydraulically connected to allow periodic (e.g. seasonal) re-adjustments.
. Open air operation is ideal for low thermal turbulence but requires active compensation of the effect of dynamic wind pressure. Modern telescopes are controlled opto-mechanical systems whose optical characteristics are optimized in real time by updating dedicated active subsystems, on the basis of error signals measured by suitable metrology. Active optics, pioneered by ESO in the 1980s with its 3.5m New Technology Telescope, then with the 8-m VLT, is now a classical example of such controlled system. The conceptually simplest control system is that ensuring that the telescope tracks i.e. that the effect of earth rotation is properly compensated by the kinematics of the telescope. With increasing size and tighter requirements, other control systems must be implemented as the telescope can no longer retain its properties passively. Permanent re-alignment and focusing, fast correction of minute tracking errors, compensation of residual fabrication errors and slowly varying flexures of optical surfaces were implemented in the active optics of the VLT, with great success. In a segmented telescope, individual segments must, in addition, be actively supported and kept aligned within extreme tolerances. The Keck telescope was the first segmented one to enter into operation (1994); the technique is proven, relies on fast evolving electro-mechanical technologies, and is highly scalable. The most challenging system is adaptive optics, which compensates light wave distrubances generated by atmospheric turbulence. To this end, a metrology system (wavefront sensor) located at the focus of the telescope measures these disturbances, and commands the shape of a moderately sized, thin deformable mirror supported by thousands of fast actuators. The correction must be repeated every few milliseconds, as turbulence changes quickly. Bar unexpected technology development, OWL's first generation of adaptive systems will work in the infrared, where the correction requires a lower number of degrees of freedom (actuators). At shorter wavelength, it will provide partial correction only -except, perhaps, under conditions of very low turbulence. A second, smaller but more complex stage will be subsequently implemented for enhanced correction. Developing the Instrument suite that will address the major science drivers for such a giant facility is bound to be extremely challenging. As an initial complement, we are envisioning an Adaptive-Optics corrected spectral analyzer with multiple "picker arms" to study many small regions at once in the whole field, from individual stars in nearby galaxies to the most distant galaxies and hypernovae, and a high-contrast diffraction-limited spectro-imager to extract and characterize planets around other Suns. Much like CERN for high-energy physics, specialized instruments will in addition be built by ad-hoc Consortia made of many Research Institutes to specifically attack the new hot topics that will inevitably come up in the years to come, out of the present generation of ground-based and space-based Observatories spanning the full electromagnetic spectrum.